Not since reading John Irving’s A Prayer for Owen Meany have I been so enamored of a boy in a novel. In Edgar & Lucy, playwright, poet and novelist Victor Lodato gives us Edgar Allan Fini, and I find myself murmuring words of gratitude for this tragic, unconventional eight-year-old. Reminiscent of Owen, Edgar is opinionated, clever and attuned to the otherworldly. He also has the same ability to cause me tangible distress over the state of his well-being. Lodato’s epic novel offers an unflinching look at the things that have the power to take us: mental illness, death, even other people. The subject matter is significant, but Lodato weaves in humor and plenty of witty conversation to counteract the heaviness. He succeeds in crafting a insightful, meaty book that is delightful to read. It is so full—of Edgar and food and dogs and art and tunnels and nature and eccentric neighbors—that one could crack it open it open a second and third time and still stumble upon something new. While I appreciate this abundance, the novel does start to feel rather stretched-out toward the end—although Lodato manages to wrap up the story beautifully. 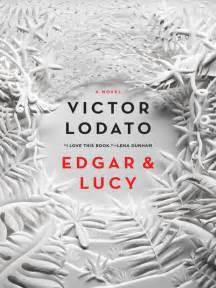 My main complaint with Edgar & Lucy is the narration. It alternates between characters and tense, which generally doesn’t bother me when I’m reading, but Lodato jumps around even within the same chapter. This switching-up provides a depth and breadth of perspective, but it also creates a sense of confusion that occasionally detracts from the flow and momentum of the story.